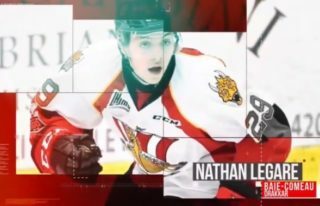 Talented NHL Draft prospects from across the Canadian Hockey League touched down in Guelph, Ont. Tuesday night with their highly anticipated Sherwin-Williams CHL/NHL Top Prospects Game performance just 48 hours away. Excitement abounded during arrival interviews as players expressed a range of feelings after meeting their new teammates, some of whom have prior connections through various avenues such as Hockey Canada involvement, minor hockey history or good old fashioned board battles in their respective leagues. After a long day of travel, players enjoyed a brief practice with their new club while also posing for the camera at the Sleeman Centre. Of course, the annual event often presents a scenario where teammates trade in their camaraderie for opposing logos as is the case with Veleno and Voltigeurs teammate Xavier Bernard who will represent Team Orr. Not every player competing has had a lot of time to prepare. Owen Sound Attack forward Aidan Dudas was the last player to be informed of his chance to shine, being announced as. an injury replacement for Ottawa 67’s winger Kody Clark on Tuesday morning. The 23rd edition of the Sherwin-Williams CHL/NHL Top Prospects Game sees Team Cherry enter on the heels of victory last year in Quebec City as the two sides combined for an event record-tying 12 goals in a 7-5 outcome. Coached by former Oshawa Generals star, Philadelphia Flyers franchise cornerstone and Hockey Hall of Fame inductee Eric Lindros this week in Guelph, Team Orr holds the edge all-time with a 13-5-0-0 record. 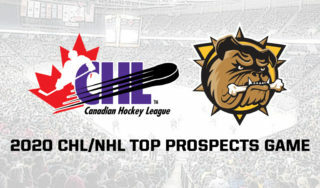 14 of the top 20 players included in NHL Central Scouting’s Midterm Rankings released on Monday will be competing in Thursday’s matchup including top-ranked North American skater Andrei Svechnikov of the Barrie Colts suiting up for Team Orr against second-ranked Halifax Mooseheads standout Filip Zadina of Team Cherry. The 40 players in attendance representing 27 CHL teams will be addressed by NHL Central Scouting Director Dan Marr to begin the day on Wednesday before undergoing on and off-ice fitness testing at the Sleeman Centre and the University of Guelph. Coming to Guelph for the first time, the puck will drop on the 2018 Sherwin-Williams CHL/NHL Top Prospects Game at 7:00pm ET/4:00pm PT on Thursday. The game can be seen live across the country on Sportsnet, TVA Sports and in the United States on the NHL Network.